Mr. Robb has practiced for over 30 years in marine and landside insurance defense as well as cargo and property subrogation. Although Mr. Robb’s principal objective in representation is to problem solve and resolve claims, Mr. Robb has tried cases to successful outcome in many of the firm’s specialties. He has defended policyholder coverage and bad-faith lawsuits, Jones Act and recreational/passenger personal injury claims, and large loss property claims. He has also tried significant marine and landside subrogation cases. Mr. Robb is frequently called upon to advise insurers on coverage questions and investigation, including losses claimed under Cargo, Stock Throughput, Yacht, Hull, P&I, Ship Repairers, Marine General Liabilities, Motor Truck, Warehouse, Business Interruption and other policies/coverages. He is regularly appointed for defense and coverage assignments by most of the domestic US marine insurers as well as many marine insurers from the London market. 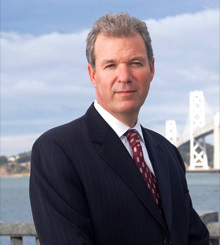 Mr. Robb has an AV-Preeminent rating with Martindale-Hubbell and was named as one of Northern California’s Super Lawyers by Super Lawyer Magazine. Dispute Resolution Developments: Selecting Law, Jurisdiction and Arbitration in Marine Insurance Policies. 15 USF Maritime Law Journal 2, p. 325. On the Waterfront: Navigating Insurance Issues in Landside and Marine Operations 19 USF Maritime Law Journal 1, p. 53. Mr. Robb has spoken before the AIMU in New York, The Pacific Admiralty Seminar, the San Francisco Board of Marine Underwriters, The San Francisco Marine Claims Association, The Puget Sound Marine Insurance Claims Association, the Marine Insurance Association of Seattle and RIMS (the 38th Annual Rims Conference & Exhibition). He frequently lectures on California insurance regulations on claims handling, and has provided in-house training to insurer clients on those and other topics.